Our brand new 2016 peshtemal collection is ready for you! 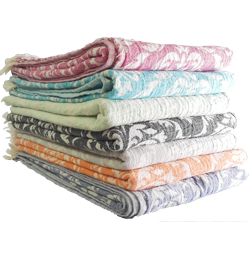 OTTO Peshtemal fouta is %100 cotton, and softer than you thought. This unique piece inspired from damask designs and will be one of your companinon in the beach and bath. OTTO Turkish towel peshtemal comes in seven different colors; black, aqua, light grey, pistachio green, jean blue, fuschia and orange.